Washington (AFP) – Firm handshakes, warm embraces, kisses, even a bit of grooming: the “bromance” between US President Donald Trump and French leader Emmanuel Macron has provided plenty of material for America’s late night TV comedians. “Trump and Macron have an interesting relationship,” comedian Jimmy Kimmel said on his talk show on ABC. “Trump very much needs a friend, because most of his old ones are going to prison,” Kimmel said, in a reference to the US president’s legal woes. “And Donald Trump, really, he cannot keep his hands off this guy,” Kimmel said before showing television clips of affectionate embraces between the pair. 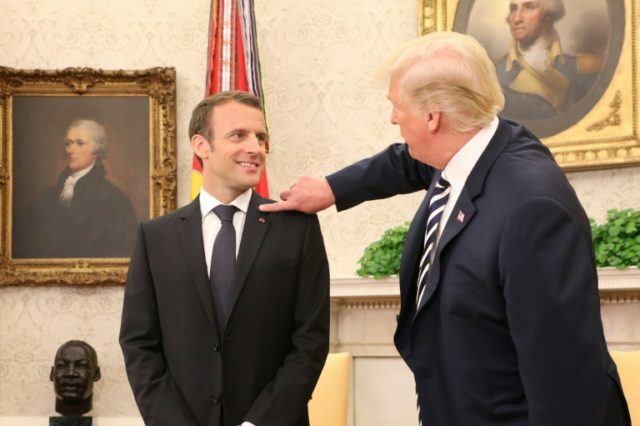 One exchange which has drawn particular attention took place in the Oval Office, when Trump brushed off what he said was “dandruff” on Macron’s jacket. “To the best of my knowledge, it was the first time a world leader ever publicly brushed dandruff off another world leader,” Kimmel said. Several comedians contrasted the supposedly frosty relationship between Trump and his wife, Melania, to his warm friendship with Macron. “You could really feel that Macron was connecting with Trump,” Noah said. “And we all know that Trump is not the sentimental type. Comedian Seth Meyers showed footage on his “Late Night” show on NBC of the 71-year-old Trump and 40-year-old Macron sharing an interminable handshake — similar to one the pair had shared last year. “President Trump welcomed French President Emmanuel Macron to the White House at 5:15 pm this evening — and they are still shaking hands,” Meyers said.